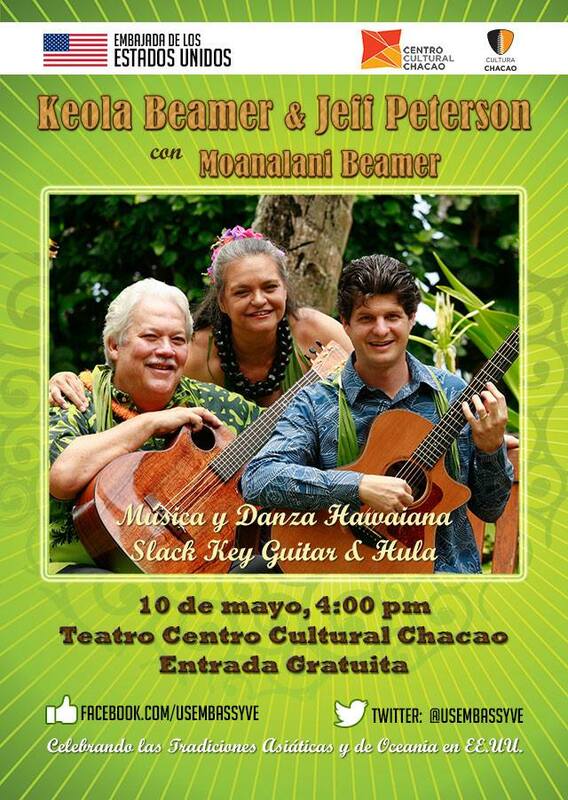 Levantine PD was honored to take Hawaiian Slack Key Guitar legends Keola Beamer and Jeff Peterson, with Hula Master Moanalani Beamer, to Venezuela with the U.S. Embassy in Caracas. While on tour, these Ambassadors of Aloha performed, conduct workshops and masterclasses, and collaborate with local Venezuelan musicians. They shared the ephemeral Hawaiian spirit of Aloha, which is the essence of compassion, love and peace; Venezuela could use a little Aloha right now. It was an incredibly special and meaningful program here in Venezuela, with true people-to-people connections created through the Spirit of Aloha and through the sharing of Hawaiian music, dance and culture. These true Ambassadors of Hawaii touched the hearts of all they encountered. With tears in her eyes, one U.S. Embassy staff member from Venezuela remarked that in her many years of running cultural programs, she had never been part of a program that did more to connect with the heart of the people of Venezuela. We offer a huge gracias and mahalo to Keola, Moana and Jeff for their tremendous efforts to share Aloha with Venezuela as it navigates difficult times. We offer a huge gracias and mahalo to the U.S. Embassy in Venezuela, and to the Cultural Affairs Officer Neal Murata and the Cultural Affairs Specialists Elena Broszkowski and Andrea Rangel for their incredible work to create meaningful connections through music, food and culture for both countries.